The Yellowstone Alpine 2 is a two person tent that's ideal for hiking and backpacking. It's designed to be portable and easy to pitch and includes two skins for extra protection against the elements. 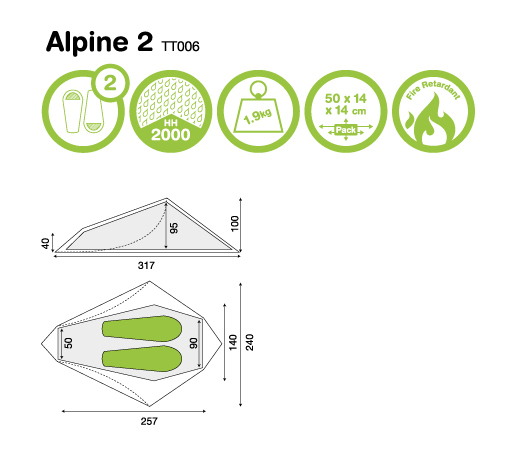 The Alpine 2 comes with pre - attached guy ropes which provides stabilitity in the wind and an integral groundsheet. It's been designed with hiking in mind, but can easily be used for conventional camping and festivals. The Alpine 2 pitches inner first with a single fibreglass pole, making it quick and easy to pitch perfect for when you need to set up camp fast. The tent only opens on the one side. The inner features a sewn-in integral groundsheet to keep out wet weather and insects. Order this tent and start planning your next trip! This tent is easy to pitch and very portable.